We’re pleased to announce the launch of our annual ETF research report, in partnership with Investment Trends. The Australian ETF industry has continued its strong growth trajectory, with a record number of self-directed investors, SMSFs and financial planners now using ETFs in Australia. Investor numbers in the Australian market reached 385,000, up from 314,000 the year before (22% year on year growth). The Report forecasts the industry to grow to over 430,000 investors by end 2019. The Report is the leading quantitative research study of the Australian ETF industry. Based on responses of approximately 8,000 investors and 800 financial planners, the study contains insights into the size and growth of the ETF industry as well as the investment behaviour and preferences of these audiences. Explore more of the findings and request a copy of the report here. New quarterly research sheds light on passive investment patterns outside of Australia. 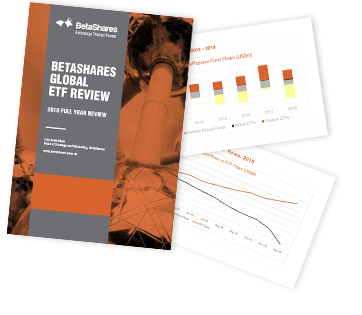 We’re pleased to announce the launch of our new, quarterly publication – the BetaShares Global ETF Review. Complementing the monthly BetaShares Australian ETF Review, which focuses on the local ETF industry, the new publication looks at key trends and developments in this industry outside of Australia. We’re pleased to announce the launch of our third active ETF with Legg Mason, and Australia’s first Fixed Income Active ETF – the BetaShares Legg Mason Australian Bond Fund (managed fund) available on the ASX under the code “BNDS”. BNDS – managed by multi award-winning Legg Mason affiliate, Western Asset – aims to provide efficient access to an actively managed and broadly diversified portfolio of high quality Australian fixed income securities. For more information on BNDS, visit the product page or download the factsheet, flyer or brochure. We are pleased to announce the launch of the BetaShares launches Global Income Leaders ETF (ASX: INCM) – providing Australian investors with exposure to a diversified portfolio of 100 global companies (ex-Australia) which are selected for their potential to generate attractive and persistent income. INCM offers Australian investors with a cost-effective way to expand the world of income opportunities in their portfolios as well as benefit from the diversification benefits that come from global shares. For more information and to request an information pack, click here. We are pleased to announce the launch of the BetaShares launches Asia Technology Tigers ETF (ASX: ASIA) – providing Australian investors easy access to Asian tech leaders such as Alibaba, Tencent, Baidu and Samsung. ASIA aims to track the returns of an Index comprised of the top 50 companies by market capitalisation in the technology and online retail industries that have their main area of business in the Asian region, excluding Japan. We are pleased to announce the launch of the BetaShares Global Robotics and Artificial Intelligence ETF (ASX: RBTZ) – providing investors with access to the global Robotics and Artificial Intelligence Mega-trend. RBTZ provides access to the disruptive Robotics and Artificial Intelligence (“A.I.”) sectors through exposure to a portfolio of global companies involved in production or use of Robotics and Artificial Intelligence products and services – including industrial robots, autonomous vehicles and applications of large-scale machine learning. 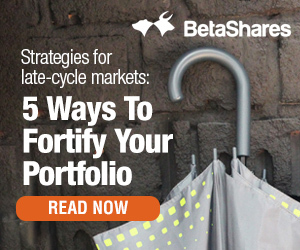 BetaShares has today announced plans to expand its global shares product suite via the launch a range of new international ETFs. The roll out of the new series of Funds will commence by initially launching three new ETFs that will provide exposure to some of the fastest growing technology investment themes globally. Access to the 50 largest technology companies in Asia (excluding Japan) including innovative powerhouses Alibaba, Tencent and Baidu. Access to the global Robotics and Artificial Intelligence (A.I.) sector through exposure to companies involved in the production or use of robotics and automation products and services. Register your interest for ASIA, BLOK and RBTZ here. We’re delighted to have been announced as the ‘Best ETF Provider – Australia’ at the The Asset’s Triple A Private Banking, Wealth Management and Investment Awards 2018. In addition to the Best ETF Provider, our two socially responsible ETFs – ETHI and FAIR – were awarded first and second place in the ‘Most Innovative ETF Product – Australia’ category. The Asset’s Triple A Private Banking, Wealth Management and Investment Awards are among the industry’s most prestigious awards, recognising the leading wealth management institutions as well as the premier financial institutions in the Asia-Pacific region. The awards are given to the institutions that offer best and most innovative ETF products and providers that keep the ETF market thriving. The 2018 BetaShares Tax guide for its exchange traded funds has been released. The Tax Guide has been prepared for an Australian resident individual investor in a BetaShares Exchange Traded Fund. It contains general information to assist you in completing your 2018 Tax Return.